There are a variety of citrus plants available, including grapefruits, oranges, tangerines, lemons and limes. Citrus trees are adapted to growing in the frost-free areas of the United States in USDA planting zones 9 and 10. Those living in areas experiencing annual frosts and freezes should grow citrus trees inside containers. Gardeners adding citrus trees to their landscapes will have attractive trees that are relatively problem-free. Citrus trees prefer growing in well-drained sand or sandy soil and will not tolerate growing is saturated soil mediums, according to the University of Florida. Select an area in your landscape situated in full sun throughout the day. All varieties of citrus prefer growing in an area receiving six to eight hours of daily sunlight. Citrus trees planted in shady conditions will eventually die. Clear the planting site of weeds, grass or other vegetation. Clear an area approximately 3 feet in diameter by hand pulling the vegetation from the area, keeping it weed-free during the life of the citrus tree. Unwanted vegetation will rob the citrus tree of much needed moisture and nutrients from the soil. Dig out an area in the sand that is approximately 2- to 3-feet deep to loosen the soil in the planting area. The University of Florida does not recommend amending the sandy soil with organic matter. Remove the citrus tree from its container and inspect the roots checking if they are root-bound. If the roots have started wrapping in a circular direction, make two to three cuts through the root ball to stimulate the roots to form new growth. Place the citrus tree into the planting hole, allowing the tree to sit approximately 1-inch higher in the sand than it was originally growing inside its container. Backfill the hole with the sand, filling it approximately one-half full. Stomp on the sand to firm the area up and water the planting hole, allowing the water to settle inside the hole before filling it up the remainder of the way. Fill the remainder of the hole with sand and stomp on the area again to firm it up around the citrus tree. Create a 4-inch high mound of sand approximately 3 feet in diameter around the citrus tree, making a water barrier. The barrier will hold the water into the planting site, as water has a tendency to run off the top layer of sand before sinking deep into the soil. Water the citrus tree again, allowing the water to leach down to the tree’s roots. Continue watering the newly planted citrus tree three times each week for the first two weeks. Gradually taper off the watering schedule to once per week as the citrus tree establishes itself into the planting site. 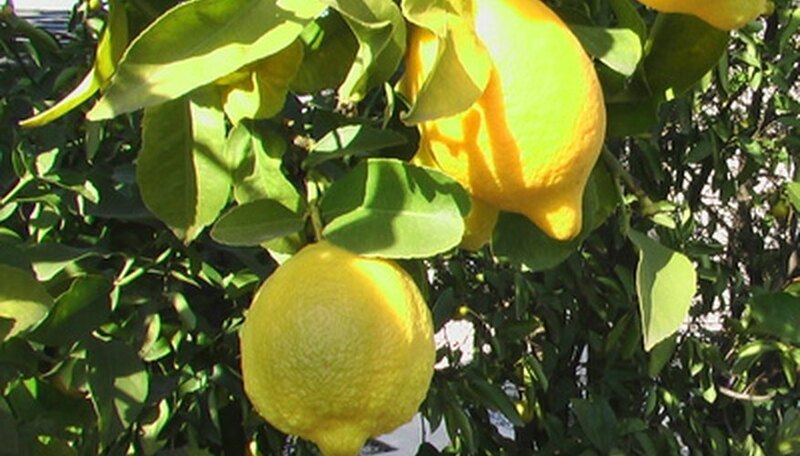 Citrus trees will have the best growth and fruit production if watered on a regular schedule. Fertilize citrus trees one to two years old with an 8-8-8 fertilizer equally divided into five to six yearly applications. Older citrus trees require an application three to four times per year applied in January through February, May through June and October through November.